For a Saturday afternoon in July, the museum was fairly quiet – adding to the building’s eerie atmosphere. I only imagined how many people used to work here – snooping through the immense volume of data and information the surveillance officers would bring in. Everyone was a spy in the time of the DDR. 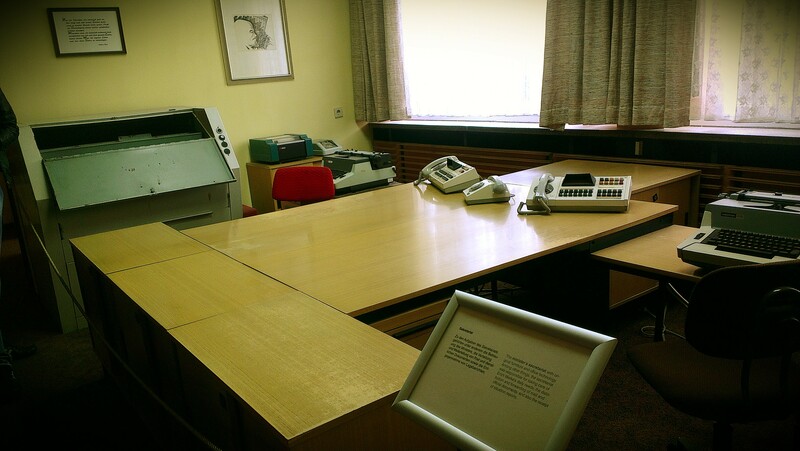 At the time of the regime’s collapse, the Stasi employed approx 102,000 employees, but then there were also the unofficial Stasi informers (or just regular, every day spies) which in total were around 500,000 (although no one really knows the real number). This was around 1 informer per 6.5 citizens! Imagine, it was pretty reasonable to guess that you had a Stasi informer in your group of friends! 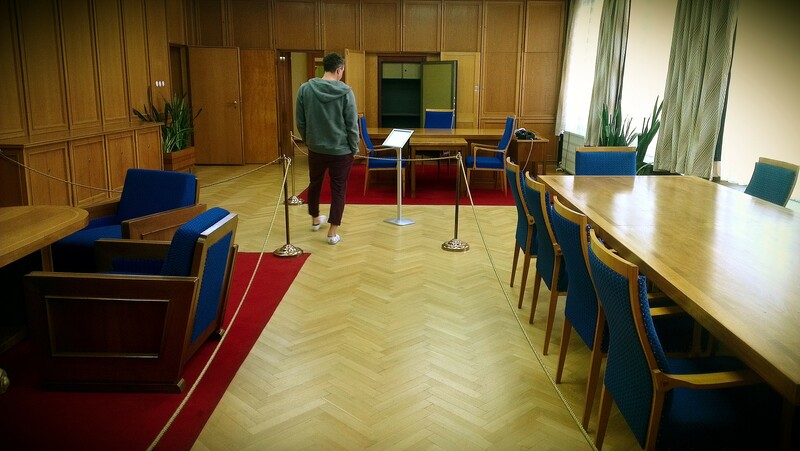 The best was taking a peek at the offices of Erich Mielke, former head of the Stasi from 1957-1989. For the head of the secret service of a socialist state that promoted equality among all citizens, his office sure did look lush. Just like everything the Germans do, organization is key when it comes to spying. In addition to setting up secret cameras and microphones pretty much everywhere (hotel rooms, apartments, bathrooms, along the street, etc. ), they also kept track of suspicious persons’ scents. 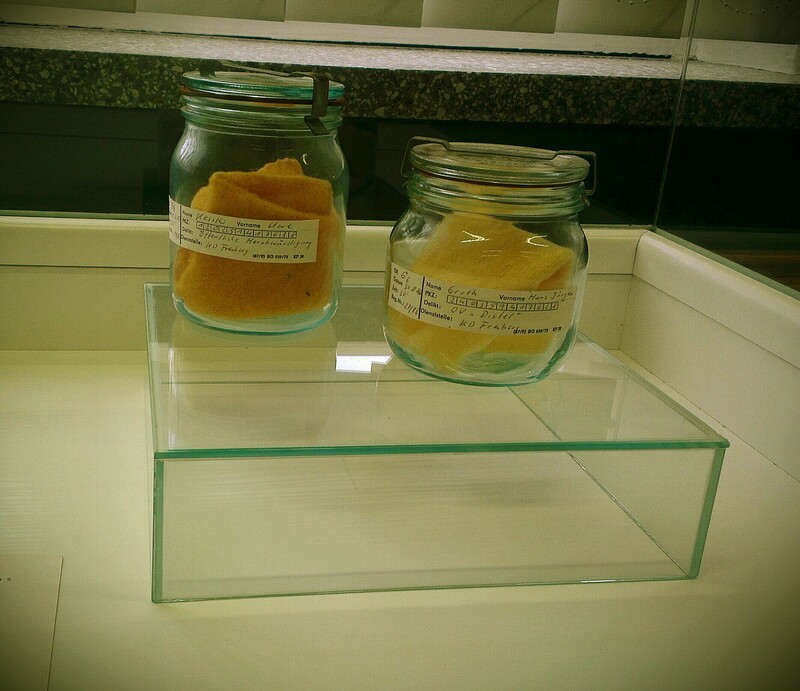 There were rows and rows of shelves full of jars with a piece of cloth in them guarding that person’s scent. When they wanted to track down the person, they used trained dogs to sniff out the suspect. How did they collect the scent? Maybe by inviting the suspect for an interview (pretending to be a journalist or whoever else they felt like) and placing a special cloth in the chair to “collect” the scent. Or sometimes they would just break into people’s apartments and steal their underwear. Once the wall fell, the Stasi immediately tried to get rid of all the information they had collected on the population. They tried to shred as many documents as they could but due to the sheer magnitude of paper, the machines collapsed and they had to resign to tearing the papers up by hand. Now, over 20 years later, the German government is still trying to put together these torn up pieces of paper and provide each citizen who has put in a request a copy of what the Stasi had collected on them. You have to wonder – would you really want to know?